Bethesda has revealed more details about the upcoming DLC packs for Fallout 3, including news that the third DLC pack will remove the game's ending and increase the maximum character level to 30. In an interview with Eurogamer, DLC Lead Producer Jeff Gardiner talked about Operation: Anchorage, the in-game simulation of the Battle of Anchorage that pits the player against hostile Chinese forces in Alaska. Players will enter the tactical combat simulator in order to assist the Brotherhood Outcasts in their quest for technology - in this case, advanced military hardware locked in a vault that can only be opened by completing the virtual mission. Because Operation: Anchorage is essentially a game-within-a-game, players will apparently be stripped of the equipment they've picked up throughout the game, and will have to complete the mission with resources unique to the simulation. "Since Operation: Anchorage can be entered at any time, we've made sure that the player will feel challenged no matter what their level is in the main game," Gardiner said. "And, since it's a simulation, we've taken liberty to add some traditional game elements to it since it's justified in this context - health and ammo replenishing stations, for instance." Players will also be able to select and command "strike teams" of different types of soldiers, like snipers or heavy weapons troops, and have access to new equipment only available in the sim, such as the Chinese Stealth Suit, which Gardiner said "works similar to Stealth Boy every time you crouch!" 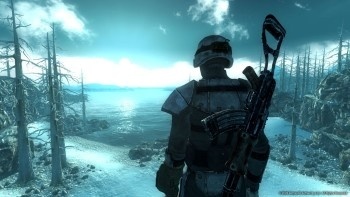 Following the release of Operation: Anchorage this month, Bethesda will put out The Pitt in February, giving players the chance to explore the bombed-out ruins of Pittsburgh in what Gardiner called a "more 'traditional' Fallout 3 quest," and then in March will unleash Broken Steel, new content which will actually extend the game's story and raise the level cap to 30. "We felt there's no harm in letting the player enjoy the game as long as they'd like, and so along with removing the game's 'ending' with Broken Steel, we figure raising the level cap would allow them to do that," he said. "We plan on raising it to level 30 - but it will be a long, hard climb to get there!" "Broken Steel not only extends the game to level 30, it alters the core ending," he continued. "It allows the player to continue exploring the ashen Wasteland and see the fruits that are born, or that die, from their decisions. It will reprise several main characters, and conclude some of the story threads left dangling." Gardiner said the DLC releases for the Xbox 360 and PC will be identical, and reiterated that this content is exclusive for those platforms - PlayStation 3 owners are still out of luck. An official release date for Operation: Anchorage, which will cost 800 Microsoft Points, has not been announced.